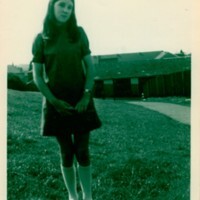 A photo of Ita McClelland aged about fifteen standing outside her school. 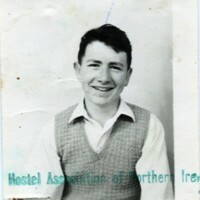 In 1944,I became a teenager. 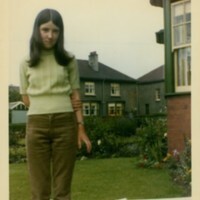 In those days it just happened. Nothing very exciting. Girls in general were not taught the facts of life. The country-side was a safe place to live,there was never any danger as were always in a crowd. 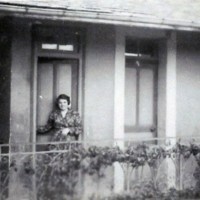 A picture of Mary Dynan aged 17 in Hotel St Jude, Lourdes, France, August 1952. 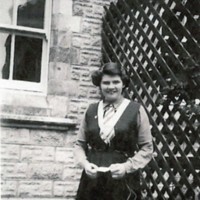 A picture of Mary Dynan in Kilkeel in June 1952. 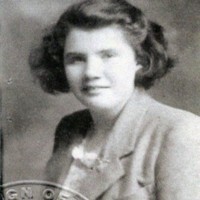 A photo of Mary Dynan with secondary school friends. 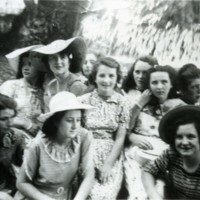 Mary is second row on the right - with a hat on!